Winning on the road is not easy in the Turkish Airlines EuroLeague. Away teams have achieved a record of 74-134 this season as home-court advantage tends to be very impactful. It takes great poise to execute on the road in front of loud crowd inspiring the opposing players, but several teams have shined in that regard this season. The table above displays the four most efficient offensive teams in the EuroLeague in road games this season in terms of points per possession. AX Armani Exchange Milan ranks just fifth in the EuroLeague this season in points per possession overall but has been the competition's top offense on the road. Milan's players, along with those of CSKA Moscow, have shot the ball a bit better in other teams' arenas this season. The top two teams in road offense are also the two teams with the largest positive gap between their home offensive efficiency and road offensive efficiency. Milan and CSKA are two of four teams this season to score at a better rate in away games than home games. The others are KIROLBET Baskonia Vitoria-Gasteiz and FC Barcelona Lassa. Fenerbahce Beko Istanbul and Anadolu Efes Instanbul are interesting cases. 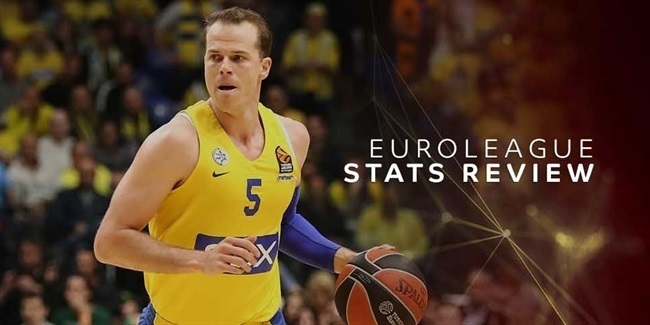 The average EuroLeague team is 0.04 points per possession worse on the road than at home. That is roughly the same number that separates the 13th and 18th best offenses in the EuroLeague this season. Both Turkish clubs have differentials right at that number. However, since they rank first and second in overall offensive efficiency this season, their marginally less efficient play on the road is not enough to knock them out of the top five in scoring efficiency away from home. On the other side of the court, only three teams have defended on the road more efficiently than they have in their home arena. Real Madrid, FC Bayern Munich, and Zalgiris Kaunas all have the unique distinction of getting stops more consistently in away gyms than in their own. 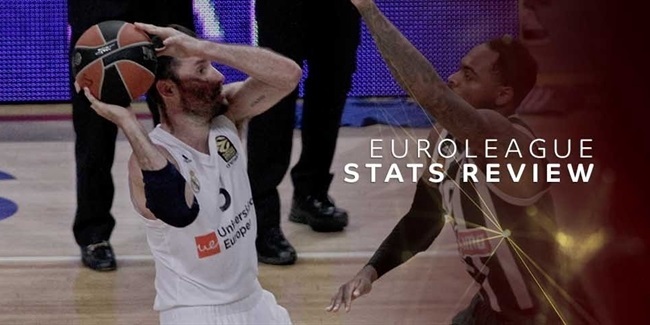 Real Madrid's defensive play on the road is especially impressive as they lead the EuroLeague in points per possession allowed by a significant margin this season. Unlike many teams whose play on one end of the floor gets a major boost from their home-court advantage, much of Real Madrid's success can be traced to their performance on the road. Panathinaikos OPAP Athens was one of the teams whose defensive performance at home outweighed their performance on the road most heavily last season, but that trend has not held up this season as the EuroLeague's second most efficient defensive team has performed at a similar level regardless of the venue – evidence that home and road splits do not necessarily hold up season to season. Zalgiris Kaunas and Olympiacos Piraeus have been two of the steadier teams in the EuroLeague in terms of defensive performance, posting very similar numbers both at home and on the road. That is notable for them because there tends to be more variability to how teams perform on the road defensively than offensively. Home-court advantage tends to be more prominent on the defensive end this season with several teams faring drastically better while competing in front of their own fans. Taking both offense and defense into consideration, only two teams have posted a better overall efficiency differential on the road than they have at home: CSKA and Milan. With the postseason just around the corner and the seeding picture becoming clearer, home-court advantage begins a more important consideration. However, it is a more daunting proposition for some teams than others.